The Hockomock Campus Report is an update on former Hockomock League athletes currently competing in collegiate sports. If you would like to submit an update, please e-mail info@HockomockSports.com. Milford’s Jarrod Casey currently leads Assumption in tackles through six games this season. Casey has a team-best 50 tackles (8.3 per game), including two tackles for loss and two interceptions as the team’s starting strong safety. Stoughton grad Brandon Swain-Price is third in receptions for the Greyhounds with 11 for a total of 250 yards and two touchdowns. The former Black Knight is averaging 19.1 yards per catch for Assumption (5-1). Another Milford alum – Patrick Corcoran – has played in five of six of Assumption’s games. King Philip graduate Sam McDonald has started in all six of Bentley’s games this season and is second in tackles with 32 – best among defensive backs. McDonald has two interceptions, four pass breakups and three tackles for loss on the season for the Falcons. Taunton’s Shane Wellman has played in six games this year with five tackles, Mansfield’s Kyle Wisnieski (four tackles, one interception), Attleboro’s Luke Morrison (two tackles) and Franklin’s Quintin McDermott (one tackle) have all appeared in four games for the Falcons. Former Franklin Panther Colton Cardinal has made four appearances on the gridiron for Boston College this season. Cardinal, who made two tackles for the Eagles last season, switched to the offensive side of the ball for 2016. From his fullback position, the sophomore has three receptions for 52 yards on the year. Oliver Ames alum Cameron Williamson has been a steady contributed for the Bridgewater State Bears so far this season. A junior, Williamson has played in all six games so far this season with 19 solo tackles and 21 total. He came away with his lone interception of the season so far in a close win over Western Connecticut and has three pass breakups. Although Brown is off to a 1-3 start, North Attleboro’s Alex Jette continues to be a bright spot. He leads the team with 25 receptions and has a team-best 271 yards through the air through four games, including one touchdown. He is fourth on the team in rushing as well with 48 yards on six carries (12 yards per carry), giving him a team-high 319 all-purpose yards. Jette is also the team’s punter, averaging 37 yards per punt with a long of 61 and six of his 24 punts landing inside the 20-yard-line. Franklin’s Craig Anderson has been a key piece as Endicott has bounced back from a slow start to the season. After an 0-3 start, the Gulls have picked up two straight conference wins heading into a trip to Maine Maritime this weekend. Anderson is fifth on the team with 17 tackles and has appeared in all five games so far. Anderson has one sack and six tackles for loss, and blocked a field goal against Nichols. Oliver Ames grad Joe Tepper has two tackles this season and returned a kick for 13 yards. Canton alum Sterlin Garvin is making an impact during his sophomore season at Fitchburg State. The former Bulldog is second in rushing for the Falcons with 133 yards on 43 carries (3.1 yards per carry). He found the end zone in Fitchburg’s win over Castleton in early September, scoring on a five-yard pass. A handful of former Hockomock players continue to contribute to Framingham State’s success. On the defensive side of the ball, Attleboro alum Tom Burns is fourth on the team in tackles with 28 with just four of the team’s six games played. Burns has also recorded three pass breakups for the Rams. King Philip graduate Brian Donahue has appeared in all six games as a linebacker for Framingham with 18 tackles, including one sack and a pass breakup. Foxboro’s Derek Gilreath has a pair of tackles in five games played. Offensively, Stoughton’s Joe Wilder, a captain, has started all six games on the left side of the offensive line for the Rams. A pair of former Kelley-Rex division rivals are now teammates at Nichols College, helping the Bison to two wins so far this season. Attleboro’s Brenden Massey has hauled in a team-high 20 catches this season for 323 yards (16.2 yards per catch). 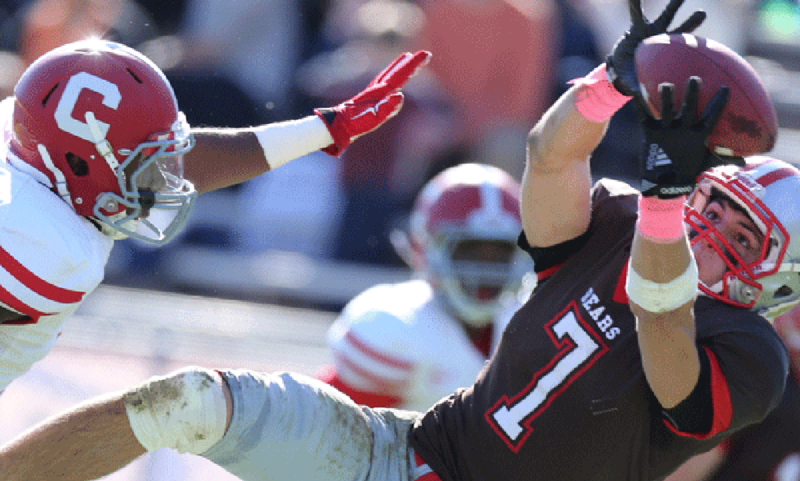 Masssey has also scored two touchdowns this season. King Philip’s Brett McEvoy is second on the team with 44 total tackles, including three tackles for a loss. McEvoy has also forced a fumble for the Bison through five games. Attleboro’s Brendan Nunes and Franklin’s Danny McDermott are both making plays all over the field for the undefeated Salve Regina Seahawks. McDermott, a junior, has completed a pass, run the ball three times and even hauled in a 20-yard reception for Salve (4-0). Nunes, a freshman, is third on the team in all-purpose yards with 210 after emerging as the team’s primary return man. Nunes (one catch) has returned five kickoffs for a total of 171 yards, including a 76-yard touchdown against Worcester State. Nunes has also made a tackle on defense for the Seahawks. UMass Dartmouth has three wins so far this reason with four former Hockomock athletes making plays on the defensive side of the ball. Mansfield’s David Collins in second on the team in tackles with 44, including 5.5 that went for a loss. Taunton’s Marcel Flynn has recorded 22 tackles, six of which have been for loss and has two blocked kicks on the season. Mansfield’s Louis Petrella had 18 tackles on the season, including a fumble recovery while Canton’s Anthony LaRose has 17 tackles and a team-high 2.5 sacks for the Corsairs. Worcester State picked up its first win of the season this past week with a close 17-14 decision over Fitchburg. On the season, Milford’s Eric Nunez is fifth on the team with 28 tackles, including one sack. Mansfield’s Aurian Dawkins has recorded 22 tackles so far in four games played with three tackles for a loss and one interception. Offensively, Milford’s Jay Rodriguez has 37 yards on nine rushing attempts this season. Attleboro graduate Spenser Powell is having an impressive senior year at Adelphi. Powell has been honored as the NE-10 Conference Goalkeeper of the Week three times already this season while the Panthers are now ranked #14 by the NSCAA. Powell has started in all 10 games with a 0.41 goals against average and 34 saves. He has an 8-1-1 record with six shutouts. Franklin’s Zach Scafati has started on defense in all 11 of Assumption’s games so far this season. The Greyhounds are allowing fewer than two goals per game. Scafati, a captain for the squad, also has four shots this year. Oliver Ames’ Chris Romero has appeared in seven games so far, including the last six straight. Romero recorded his first career point, scoring his first collegiate goal off a rebound. Over at Brandeis, two former Hockomock players are making an impact for the Judges’ offense. North Attleboro’s Josh Ocel leads Brandeis in points with 11, tying for a team-high in goals (4) and assists (3). King Philip’s Andrew Allen is third in points (7), having netted a pair of goals this season while tying Ocel for the team-high with three assists. The defending MASCAC champion Bridgewater State Bears have five former Hockomock athletes on the roster this season. The Bears (5-5-1) have Foxboro’s Sawyer Fleck, Riley Fleck and Brian Bortolotti along with Milford’s Justin Borges and Mike Da Silva. Sawyer Fleck is currently tied for third on the time with three points on three assists this season while Bortolotti has scored one goal. Riley Fleck has started in eight games this year while Borges had made three appearances off the bench. Oliver Ames alum Adam Borbely has been a key player in Colby Sawyer’s 6-4-1 start this season. Borbely has notched one assist by has started in all 11 of the Chargers’ games so far this year. His 722 minutes played ranks sixth most on the team and he has registered two shots on goal. Wentworth has recorded an 8-2-4 record so far this season with a pair of Hockomock grads contributing. Franklin’s Joe Kalil has started 13 of the team’s 14 games and registered five points – two goals and one assist. Kalil scored in a win at MIT and then again at home against Western New England. OA graduate Gaston Cetrangolo has made six appearances for Wentworth this season. Keegan Nutt continues to make an impact in Easton, this time for the Stonehill Skyhawks. The former Oliver Ames standout and 2015 HockomockSports.com Best XI selection has played in and started all 12 games for Stonehill (5-7), just one of four players to do so. Nutt netted his first collegiate goal against Franklin Pierce back in September and has two assists this season. King Philip graduate Joe Kellett has played nearly every minute of his rookie season so far for the 8-0-2 River Hawks of UMass Lowell. Kellett has started in all 10 of the team’s games (10) – just one of seven players to do so. His 930 minutes played rank fourth on the team and he’s registered four shots on goal. A trio of Hockomock alum have played in all 13 of Assumption’s games so far this year, helping the Greyhounds to a 6-6-1 record. Taunton’s Tayla Morais, a senior forward, has scored once and started a pair of games. Franklin’s Alexis Stowell has made five starts with a goal and assist while 2015 HockomockSports.com Player of the Year Victoria Stowell has come off the bench in each game so far. A pair of former teammates and MIAA State Champions found themselves on the same pitch again, this time as opponents when Kristi Kirshe and Williams College hosted Nicole Ellin and Bard College. Kirshe and Ellin were both part of Franklin’s title winning team in 2012. Kirshe notched two assists in the game and the Ephs emerged with a 5-0 win. Earlier this month, Kirshe became Williams’ (defending 2015 NCAA DIII National Champions) all-time leader in points with 102 and was named NESCAC Player of the Week two days later. For Bard, Ellin has started on defense in all 12 of the Raptors’ games this season. Bard is 7-5 overall this season. North Attleboro’s Jamie Grinavic has been a key piece for Bentley this year as the Falcons are off to a 6-3-2 start this season. Grinavic, a senior midfielder, is fourth on the team in points after registering three assists and scoring one goal for five points. She’s just one of seven players to start in all 11 games so far this season. Goals have been hard to come by in Bridgewater State’s games this year – both for and against – but a trio of Hockomock alums have helped the Bears in getting points in eight of their 11 matches. Taunton’s Alana Vincent leads BSU in scoring, netting four goals so far this year. The Bears have only allowed seven goals this season with Mansfield’s Katie Bongarzone (11 starts) and Molly Shield (10 starts) being big reasons why. The Boston College Eagles are off to a 10-4-1 start this year with former Hockomock League MVP Lauren Berman playing a big role. Berman has started all 15 games and played 1,205 minutes, good for fourth on the team. She has netted four goals so far and six assists, good for 14 points, third most for BC this year. Milford’s Kaley Pratt has been a spark off the bench for Eastern Connecticut State this season and netted the game-winner in overtime against Keene State this past weekend. Pratt has three goals and one assist on the year, which puts her second on the team in points. Stoughton’s Rachel Berkowsky has started eight games so far for the Warriors (8-2-2) with one assist. Oliver Ames’ Nicole Taylor has helped Endicott to a strong 9-2-2 start this season. Taylor, a senior captain, has started in seven games so far with the Gulls recording a 7-1-1 record in that stretch. The Gulls have limited opponents to just nine goals in those nine games with Taylor being a key piece on defense. Stoughton’s Shelby Sprague continues to be an offensive juggernaut for Massasoit. After scoring 25 goals last season, Sprague has already scored 22 goals this year for the Warriors. Providence College women’s soccer is off to a 9-4-2 start and is allowing less than a goal per game so far with two Hockomock alums playing big roles in the Friars’ defense. OA’s Kendall Andrew has appeared in 14 of the 15 games so far for the Friars while Canton’s Hailee Duserick has appeared in 10 games with seven starts. Canton’s Kim McNally has played a big part in Sacred Heart’s 5-4-3 start this year, playing her usual strong defense but also contributing on the offensive side of the ball. McNally scored her first goal of the season in a 1-0 win on the road at Saint Peter’s in early September and then netted her second goal of the year in a 3-0 win over Robert Morris in early October. Brianna Duserick has helped Stonehill to an incredible start, one that included the Skyhawks being ranked as high as #4 in the NSCAA Poll. Duserick, a Canton alum, is third in points for Stonehill (10-2-1) with one goal, which came at Franklin Pierce, and five assists, the last two coming in consecutive games against Assumption and Saint Michael’s. Sharon graduate Meg James is just one of seven players to start in all 13 of the University of Vermont’s games this season. A defender, James has been a vital piece for the Catamounts over the years. Check out our feature on James from earlier this year. Canton graduate Avery Devoe is seeing a lot of action for Ball State University this fall, the Cardinals registering eight wins through 20 matches so far. Devoe has 14 starts and played in 60 sets so far, notching 61 kills and serving over 90% so far. She leads Ball State with a total of 48 blocks so far. At Bridgewater State, Mansfield’s Alyssa Kelley continues to contribute on defense for the Bears. Kelley has 115 digs and 193 serve receives thus far. Oliver Ames grad Megan Tamasanis has registered 23 kills in 33 sets played this season for the Bears. Junior outside hitter Lauren Beecher is fourth in kills for the 9-9 Dickinson Red Devils. Beecher, a former Mansfield Hornet, has played in eight of Dickinson’s nine game, twice hitting double digits in kills. Beecher had 10 kills in a 3-1 win over Haverford and then 10 more kills on the road in a 3-2 win at Keystone. Attleboro’s Michelle Sheehan is making an impact already for Mass Maritime as a freshman. Sheehan is second on the team with 170 assists and has 41 kills (fifth on the team) and has registered 150 digs so far for the Buccaneers. Two former Hockomock rivals are now teaming up for the Suffolk Rams, who have played 18 matches this season. Canton’s Chidera Nwankwo is third in kills for the Rams with 82, hitting at a team-best .212 clip. Nwankwo also has a total of 28 blocks, which is second on the team. Taunton’s Alyssa Gibson, a freshman, has played in 14 matches so far and registered 18 kills and seven blocks. Julia Murphy has hit a couple of milestones in her final year with the UMass Boston volleyball team. The Canton alum recorded her 1,000th career kill in a 3-0 win over Western Connecticut back on September 17th and was named Little East Offensive Player of the Week just two days later. In Murphy’s next game, she recorded her 121st career solo block, which set a new program record for the Beacons. Westfield volleyball has 10 wins already this season with King Philip graduates Brigid Murray and Micaela Murray both factoring in. Bridget Murray leads the Owls with 499 assists this season, ranking fourth in the MASCAC with 6.61 assists per set. Bridget also has 21 aces on the season, tied for fourth on the Owls. Micaela Murray, in her first year, has three kills, four assists and a team high 53 aces, 0.76 per set – good for first in the MASCAC. WPI volleyball has three Hockomock players to thank in part for its 17-4 start to the season. King Philip’s Melissa Daigle is third on the team in with 114 kills and also has 55 digs and 13 blocks. Franklin’s Shay Feeley is second on the team in assists with 319 and also has 101 digs and 24 aces, first on the team. Oliver Ames’ Caroline Meyer is third in assists with 35. Mansfield’s Janet Maher is just one of five players on Bridgewater State to start all 11 games so far, with the Bears posting a 7-4 record. Maher, a defender, has helped limit opponents to 26 goals against while also registering an assist herself. King Philip’s Kathryn Jacobson has appeared in nine games for the Bears and Foxboro’s Jill Delaney has played two games in goal with just one goal allowed. Attleboro’s Kelsey Wagner has made two appearances for Duke Blue Devils, the #2 ranked team in the country with an 11-2 record. Wagner has played just under 40 minutes so far this season with three saves. LIU Post is off to an 8-3 start this season and has been ranked as high as #1 in the NFHCA poll. Oliver Ames graduate Molly Cunha has appeared in nine games so far for the Pioneers. Four former Hockomock players are making an impression for Merrimack (4-6) field hockey this season. Canton grad Mary McNeil is second on the team in points with four goals and four assists while Franklin’s Hannah Magerman is fourth, having scored three goals with two assists. Milford’s Jessica Palmer has appeared in nine games so far with four starts while Canton’s Lindsey Nolte made her first collegiate appearance earlier this year. Katie Notarangelo is just one of five players to have started all 11 games of the season for MIT. 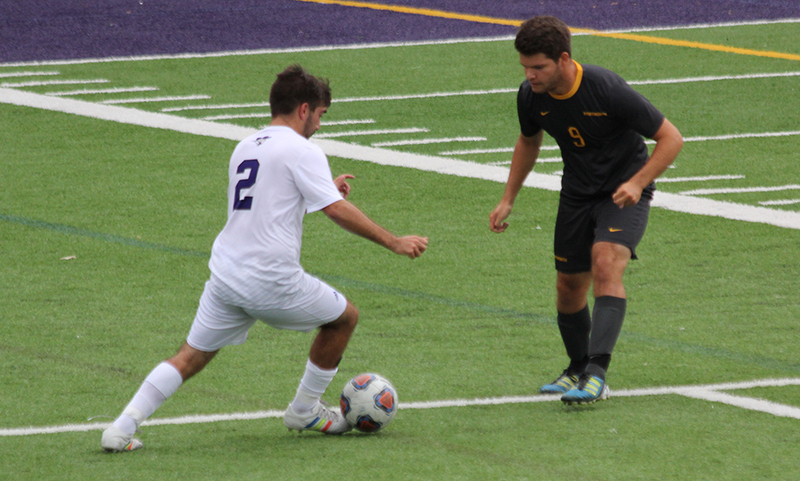 The Engineers are off to a 9-2 start with Notarangelo playing a big role in midfield. The Foxboro alum has scored twice this season, once in a win over UMass Dartmouth and again in a win over WPI. Regis College is off to a 6-5 start this season with a pair of former Hockomock players playing a big part. Oliver Ames’ Yvone Abate has started in every single game for the Pride so far. Stoughton’s Ashley Chipman has played in all 11 games with four starts and has netted a pair of goals. For her efforts, Chipman was named NECC Rookie of the Week earlier this month. Former HockomockSports.com Player of the Year Hannah Friend picked up her second NE-10 Rookie of the Week honor earlier this week, helping Saint Anselm’s to a 10-2 start. Friend leads the Hawks with seven goals and two assists for a team-high 16 points. Franklin’s Maddie Bressler and North Attleboro’s Rose Mooney each have a pair of goals and assists for six points. Franklin’s Elizabeth Alie, a senior defender, has started in all 12 games for the Hawks this season while Canton’s Mary Nee, a freshman, has appeared in 11 games and registered one assist. 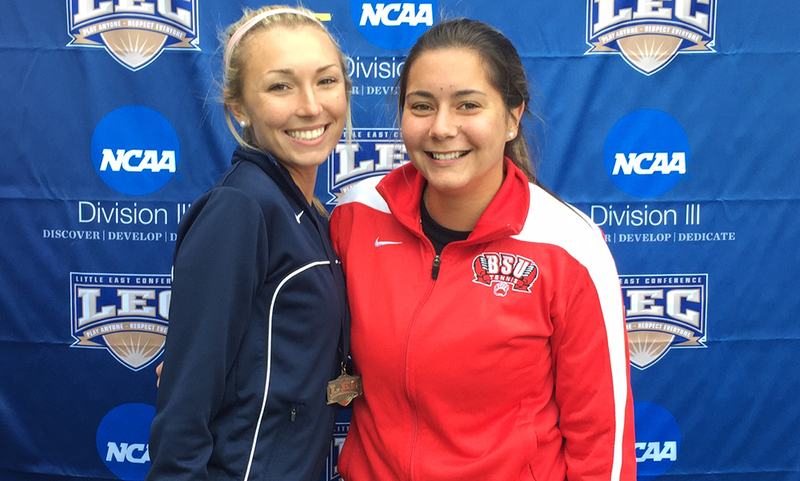 Former Franklin Panther Sammy Rondeau is second in points for the 7-5 Simmons field hockey squad. Rondeau has potted six goals and notched four assists for the Sharks. Rondeau has scored twice in two games this season, in home wins over Nichlos and Wheelock in September. Springfield College’s field hockey team has picked up five wins in its first 12 games this season with a pair of Hock alums factoring in. North Attleboro’s Emily Knobel is tied for fifth on the team with five points, scoring once with three assists. Knobel scored against Husson and had assists against Keene St., Husson and Saint Joseph’s. Mansfield’s Allie Skinner has started in all 12 of the Pride’s games so far with one assist. Taunton’s Katelin Morrissey is tied for second in points for the Corsairs of UMass Dartmouth (4-10). Morrissey has scored six goals and added one assist for a total of 13 points. Franklin’s Allison Burke has started five games in net and played more than 400 minutes so far. She has a team-high 48 saves with a 2.33 goals against average. Oliver Ames graduate Carly Cidado is making an impact in her first year at WPI. The freshman has started all 12 games this season for the Engineers, registering two goals and three assists for seven points – tied for fourth best on the team. Cidado scored in her first ever game and then netted another in a win over Clark last week. She had assists against Bridgewater State, Elms and Smith. Former Milford standout Jenise Madden has had an incredible start to her collegiate career, being named the Massachusetts State Collegiate Athletic Conference Women’s Cross-Country Rookie of the Week an astounding four times already. Madden was the Bears’ top runner at the James Earley Invitational at Westfield State, finishing in 23:14.83 (22nd out of 459). Also at Bridgewater State, another first year runner is turning heads. Taunton’s Trevor Wysong was named the MASCAC Men’s Cross-Country Rookie of the Week for the third time this season. Wysong was 50th out of 432, finishing in 27:00.24 at the James Earley Invitational. Oliver Ames’ Nick Carter has played in three matches for Saint Anselm’s this season. In the season opening Bowdoin Invitational, Carter shot a 153 to finish ninth overall. At the NE-10 Championships, Carter was 56th with a 169 and then finished 36th at the St. Rose Shootout with a 161. North Attleboro’s Eric Marchetti has played in three tournaments so far this season for the University of Rhode Island, finishing in the top 65 in each of them. At the Doc Gimmler at Bethpage State Park, Marchetti tied for 35th with a 216, just six strokes over par. At the Hartford Hawks Invitational and the Quechee Club Collegiate Challenge, Marchetti finished 61st overall both times.